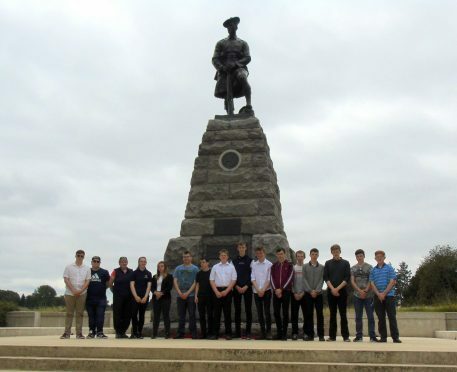 Teenagers from Moray and Nairn made a poignant visit to France to pay their respects to soldiers killed during World War I. The group of Army Cadets said touring battlefields where major losses occurred during the Somme offensive in 1916 was an “eye-opening” experience. The youngsters, led by Staff Sergeant Instructor Graeme Wells, also visited cemeteries where British troops were laid to rest and other memorial sites. The Battle of the Somme was fought from July 1, 1916, to November 18 that year and was intended to bring about a quick victory for the Allied forces. However, it turned into the largest battle to be fought on the Western Front during the Great War. More than one million men were wounded or killed during what is now recognised as one of the bloodiest bouts of conflict in human history. Some of the most emotional moments of the three-day trip came when the teenagers attended at the graves of local soldiers. They visited the resting places of men from the 51st Highland Division and Cameron Highlanders, at Hamel Newfound National Park and High Wood respectively. Cadet Corporal Innes Stone played the bagpipes as his colleagues lay wreaths at a memorial to pipers at Longueval.